Want to add Character to your Deck? Add a Pergola! Is your new deck missing something? What could it be? Well, what about a Pergola (Seen in the picture to the right)? A pergola is an architectural structure that creates a shaded sitting area using cross-beams and a sturdy open lattice supported by vertical posts or pillars. Pergolas are not only functional, but they are incredibly visually appealing, adding another level of sophistication to your new deck. You can even considering adding a climbing plant, like wisteria, or go old fashion and add grapevines. Either way, the addition of vegetation will add both aesthetic appeal and extra shade to your deck. That’s what we like to call a win-win! Focal Point: Every yard or landscape needs a focal point. Your new pergola could be yours! Privacy: Tired of your nosey neighbor watching you and your family enjoy a nice sunny day on your deck? A pergola adds an element of privacy to your deck. 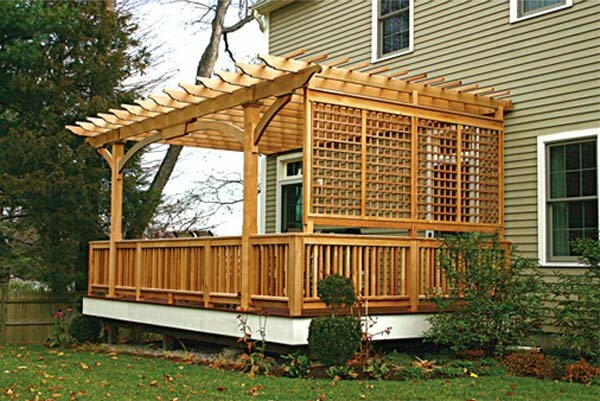 Add Value to your Home: Adding a pergola to your deck will also boost the value of your home. Freedom Fence and Home is a Maryland based company specializing in the construction of fences and decking. We do not use subcontractors and stand behind our work. We offer both wood decks and low-maintenance decks. Wood Decks: Wood decks are the most cost affordable option and are a great way to add value to your home. All wood decks are framed with pressure treated lumber which helps prevent decay and termite damage. Low-Maintenance Decks: Low maintenance decking is a great way to enhance your backyard without the maintenance. The deck frame is still constructed with pressure treated lumber while the flooring and railings are PVC or vinyl. We proudly serve Baltimore, Harford and surrounding counties. This entry was posted on Tuesday, February 12th, 2013	at 9:55 pm	. Both comments and pings are currently closed.